WASHINGTON - At the beginning of his long and well-lived life, George Herbert Walker Bush, who in politics was always prosaic, acquired, by way of a grandfather, the name of a British poet and priest (George Herbert, 1593-1633). He acquired much else from family inheritance. The future 41st president was descended from a governor of the Federal Reserve Bank of Cleveland — from financier George Herbert Walker, whose name is on golf’s Walker Cup — and from a U.S. senator — his father Prescott, of Brown Brothers Harriman, the Wall Street investment house whose partners included Robert Lovett, a future secretary of defense. Rejecting family entreaties that he go to Yale before going to war, he enlisted on his 18th birthday and promptly became the U.S. Navy’s youngest commissioned aviator, compiling 126 carrier landings and 58 missions. After Yale, he spurned a Wall Street career and with his wife — the former Barbara Pierce, a descendant of the 14th president, Franklin Pierce — headed in his Studebaker for the West Texas oil patch. But he took Wall Street with him in the form of connections and capital that helped launch the Bush-Overbey Oil Development Co.
Richard Nixon considered Bush as a running mate in 1968, but chose Spiro Agnew. In 1970, Bush’s plans for a rematch with Yarborough crashed when Lloyd Bentsen defeated Yarborough in the Democratic primary. So Bush ran to Bentsen’s left — e.g., supporting gun control — and again lost. 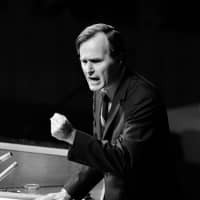 He was 46, twice defeated, and his political future, if any, depended on the patronage of others, beginning with Nixon, who made him ambassador to the U.N. and then chairman of the Republican National Committee when the job involved defending Nixon against Watergate accusations, which Bush dutifully did. 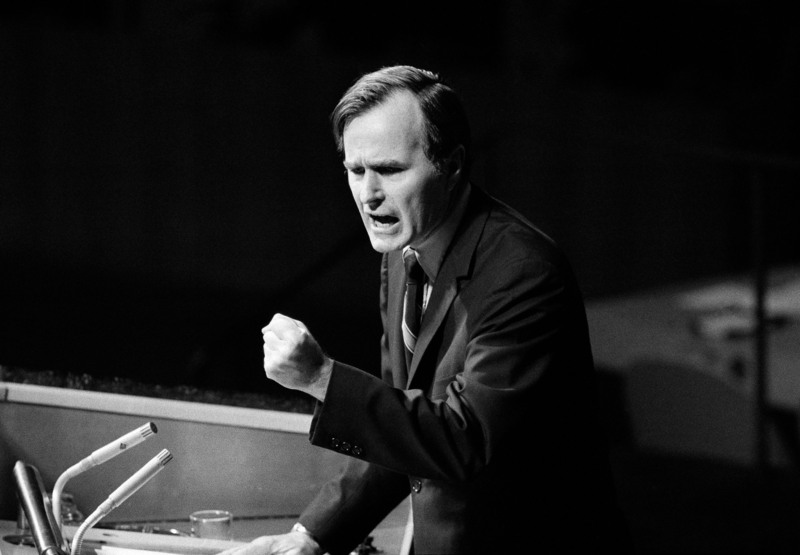 President Gerald Ford considered Bush as his vice president, but chose Nelson Rockefeller. He became chief envoy to China when Secretary of State Henry Kissinger’s close attention to that country made the envoy’s job merely ceremonial. Then, by becoming CIA director, Bush removed himself from consideration as Ford’s 1976 running mate.